Boiled Hijiki is one of the most popular Japanese home cooked dish, however some people feel it pain to soak hijiki in water until tender. Actually dried foods like hijiki can be soaked itself when you wash it and put it up to a colander. Doing so, water soluble component will not be released and you can absorb nutrients effectively. Adding the vegetables of the season beside boiled hijiki, it will be extremely satisfying. The ingredients are dried hijiki, Aburaage(deep‐fried tofu), carrot, (peas), Japanese leeks, oil for frying, "soup stock and soy sauce mixture", and water. Wash Hijiki briefly in a sieve. During draining the water in sieve, Hijiki will be soaked. Cut them into appropriately pieces. Chop aburaage and cut carrots into thin and bigger. Heat frying pan and saute them lightly over high heat. and 100cc of water for five minutes. During that, add sugar to taste. When it loses water, add the leeks (or peas) slice at a slant. After it becomes soft, take pans off the fire. If you put it longer, the color will get worse. ✍Hijiki is low calorie and rich in minerals. Hijiki grew in spring, but in Japan Hijiki is popular as a dry food throughout the year and very useful as a storage food. Also Hijiki is good with oil. You can eat them by boiling after frying. If you fry them longer, the skin will peel off. So you should fry briefly over high heat. 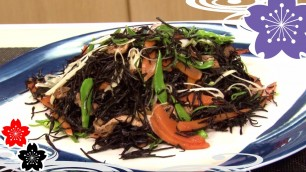 When you put hearty fresh vegetables besides boiled Hijiki, you can eat it as a salad. *How to make "Dashi soy sauce"
Put the ingredients in the pot. Boil them briefly and let it cool. The ingredients of "dashi soy sauce"